PM Netanyahu meets opposition chairman Herzog, says it is important to show the world a united front on Iran issue. Prime Minister Binyamin Netanyahu and opposition chairman MK Yitzhak Herzog on Tuesday evening agreed on a united front with regards to the deal struck between the six world powers and Iran. Netanyahu met Herzog in his Jerusalem office and updated him on the briefings that were given at the Security Cabinet regarding the security significance of the nuclear agreement. MK Herzog reiterated his remarks made earlier on Tuesday afternoon and said that this is a bad agreement. He added that he would do his utmost on behalf of the security of the State of Israel in the new situation that has been created. Netanyahu told Herzog that the fact that there is agreement between the coalition and the opposition in Israel regarding the danger that this agreement poses to Israel's security is especially important at this time. He added that it is important to show the world a united front on this issue, which is linked to Israel's most significant national interest. 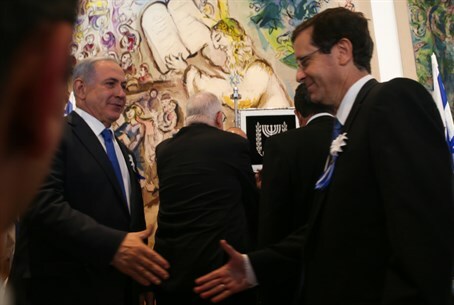 The cooperation between Netanyahu and Herzog comes even though Herzog only on Monday blamed Netanyahu for the Iran deal being “a tragedy of the ages,” as he put it. Speaking at a meeting of his Zionist Union party, Herzog said that Netanyahu had “failed” in allowing the Iranian deal to go through by not doing “everything possible” to stop it. Earlier Tuesday, at a press conference in Jerusalem with visiting Dutch Foreign Minister Bert Koenders, Netanyahu decried the deal as a "bitter mistake of historic proportions." "In every area where it was supposed to prevent Iran attaining nuclear arms capability, there were huge compromises," he added. "I will refer later to the details of the agreement, but before that, I would like to say here and now – when you are willing to make an agreement at any cost, this is the result." Netanyahu later made clear that Israel “is not bound by this deal with Iran, because Iran continues to seek our destruction. We will always defend ourselves."